Can you wrap anything other than vehicles? Virtually any surface can be transformed with adhesive vinyl. They can be applied to vehicles, building surfaces (including concrete), furniture, windows, floors, ceilings, and even helmets. Adhesive technology will allow adherence to many surfaces while still allowing for future removal. I don’t know how to design or layout a wrap graphic. Our talented and experienced Graphic Art department will consult with you to meet and exceed your expectations, as well as send you a proof for your review and approval. We also have many pre-designed templates to choose from to craft a fully colored, designed graphic that can be integrated with your company’s colors, logos, and style with minimal cost of design and minimal lead time in the design process. Any special care required to maintain the wrap? Just basic wash (machine or hand). Avoid waxing, brushes, abrasives, pressure washing, solvent based cleaners. Is a wrap a good way to cover up a bad paint job? Vehicles with excessive rust, flaky paint, or non-factory paint jobs would not be considered good candidates for wrapping. Results will be less than ideal and paint may flake upon removal of the wrap. Can I afford to wrap a vehicle? If you’re already thinking of expanding your advertising budget, you should think of wraps. Wrapping your vehicle allows you to advertise your business while you’re parked at a job, making a delivery, or even when you’ve got the vehicle parked in front of your own business. It is possibly a way to bypass tough sign restrictions that your landlord and/or your city may impose. They offer the highest ROI and CPI versus many other traditional forms of advertising. 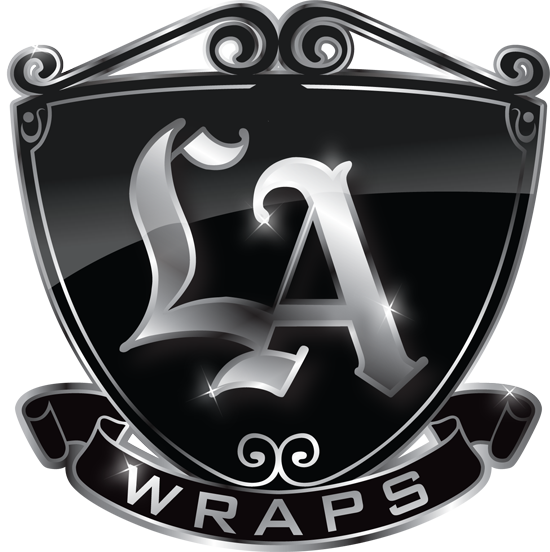 LA Wraps offers a highly competent design and installation service at extremely competitive rates. Let us help you achieve your vision and maximize your advertising dollar. Should I be concerned about wrapping a leased vehicle? 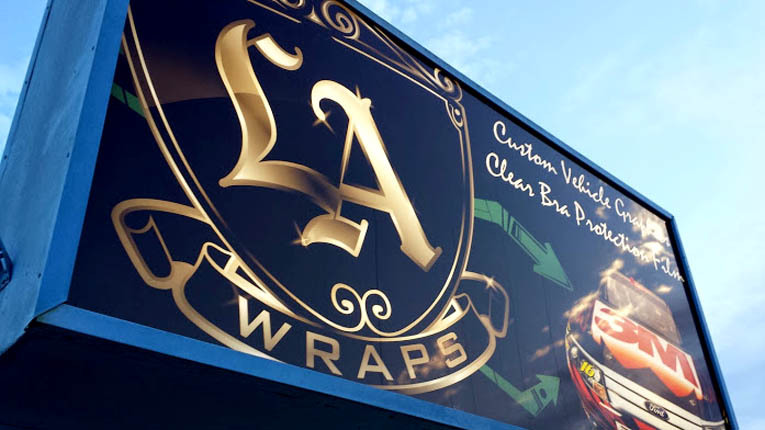 With the proper care, your wrap reduces the amount of scratches on the vehicle’s paint. It’s a win-win situation. Will a wrap damage the paint on my vehicle? Think of wraps as sunscreen for your car; the vinyl can actually shield the paint from the elements. Upon removal, the paint below a properly cared-for wrap can look the same as the day it was applied, and even better than the paint of a vehicle that did not have a wrap to protect it. What is the expected lifespan of vinyl lettering and graphics? Generally, wraps are good for 7 years against fading and cracking. Perforated window sections and horizontal surfaces (hoods and roofs) have a 2-3 year life span.Since vehicles vary widely in mileage and conditions driven as well as in maintenance, the expected lifespan of each wrap may vary. We offer a 1 year warranty on workmanship and materials. Please see our terms and conditions for full warranty information. Please note that the longer a wrap has been on a car, the harder it is to remove.